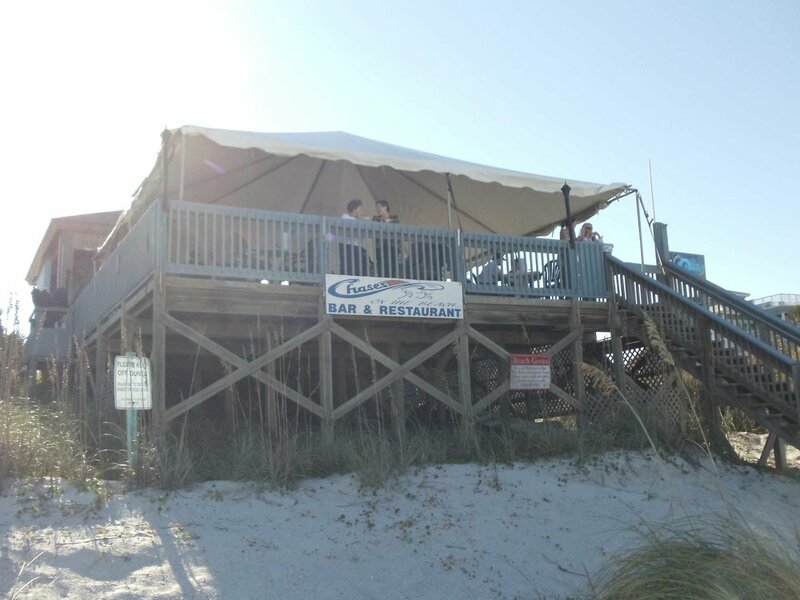 Chases on the Beach is a Florida beach bar located in New Smyrna Beach. Discover this great Florida beach bar. Chase's is a New Smyrna Beach landmark, and we are glad it is still there. You pull up to Chase's and are greeted by a valet and a colorful and tropical front entrance. Ah, another great Florida beach bar. There is a covered deck out by the beach. You can sit at the bar or a table. We were surprised to find that New Smyrna allows cars on the beach just as Daytona Beach does. The restaurant draws people from the beach in their bikinis and flip flops, and they mix well with the fully clothed people from the street. Crowd watching is part of the fun at any good Florida beach bar. There is even a cat that wanders from table to table looking for some tasty morsels. Even cats like Florida beach bars. The DJ was playing loud and current music when we arrived, but they were preparing their large stage for the evening's band entertainment. There is a pool with a volleyball net and bikini contests. Chase's has indoor dining and an indoor bar. It has the outdoor, thankfully, covered deck area and a "tiki oasis". So many great places to sit and enjoy yet another legendary Florida beach bar. You gotta love living in Florida. It is hard to figure out when and if this great beach bar has live music. More often than not they do not have live music. We are sure they have their reasons but it would for sure be a top rated Florida beach bar if they did have live bands more regularly. Howeve, this Florida beach bar does like to hold bikini contests. Some might prefer that to live music.